If you have a brand new electric chainsaw, leaf blower, or other yard equipment, you are going to need a good quality extension cord. These cords help extend the range of such power tools, allowing them to operate away from a power outlet. Outdoor electric cords are also very useful during Christmas or Halloween, or any occasion when you have to light up your yard/lawns. They are also indispensable for outdoor patios and decks. When it comes to extension cords, the market is well and truly overcrowded. Many of us end up picking a random extension cord, without giving due consideration to its specifications and suitability for the task at hand. This is a big no no since we are dealing with electricity. Never use an indoor cord for outdoor use, especially on a regular or long-term basis. 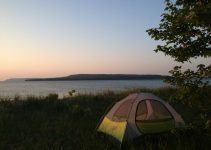 Outdoor cords are rated “W,” and have more durable insulation and jackets. Indoor extension cords are rated “S” and will not last long in the temperature variations and moisture/water exposure outdoors. Always try to keep the length of the cord to a minimum. For instance, if you have a 20-foot long backyard, look for a 20-25 foot long extension cord. The longer the cord, the lesser its capacity to carry the electric charge. So if you buy a 50-foot cable for a task that needs just a 25-foot cord, you are wasting your cash as well as energy efficiency. Gauge denotes the thickness of the wire used inside the extension cord. According to the American Wire Gauge (AWG) system, the gauge numbers start from 10 and may go all the way up to 20. The simple formula is: the smaller the gauge number, the thicker the wire used inside the cord. Thicker wire (lower gauge) ensures better flow of electricity. 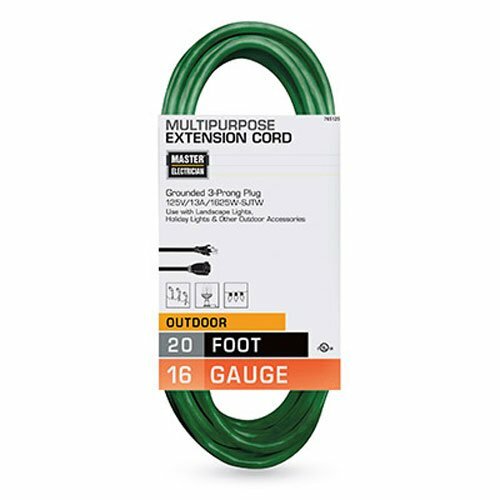 10 and 12-gauge cords are ideal if you have heavy duty power tools. For devices rated at higher amps, use these thicker gauge cords. It is very important to match the extension cord gauge with the power rating of the appliance you plan to plug into it. And you also need to keep an eye on the length of the cord. A 50 foot long 14 gauge cord will transfer less charge (amps) than a 25 foot long cord of the same thickness. 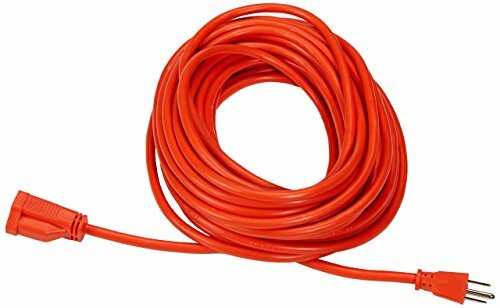 For instance, if you have a 15 amp rated chainsaw, a 14 gauge medium duty cord will do the job for a distance of 25 feet. But for 50 or even 100 feet, a safer option for the same chainsaw would be a thicker 12 gauge cord. Check the manufacturer guide for the correct amp requirements of your device. Don’t link multiple extension cords to extend the range of your power tool. Use a single cord of the correct length for maximum safety. Check the product to ensure that it has been adequately tested and rated by a recognized safety testing lab, (for example, Underwriters Laboratories (UL) here in the US, or the Canadian Standards Association (CSA) north of the border in Canada. Outdoor extension cords are durable, but unplug and store them away indoors when not in use to extend their service life. If the cord is damaged in any way (cut insulation, frayed wires, or flattened bits), do not try to use it. Buy a replacement instead. While you can use an outdoor extension cord indoors, never do the opposite. Indoor cables are not designed to withstand the external environment. 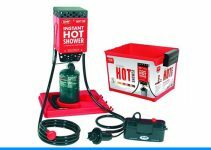 Coleman is one of the most popular names in the business, and their extension cords are available various lengths, and in packs with single and multiple pieces. The 100 feet long cord is rated at 16 gauges, and suitable for 10 amp devices. 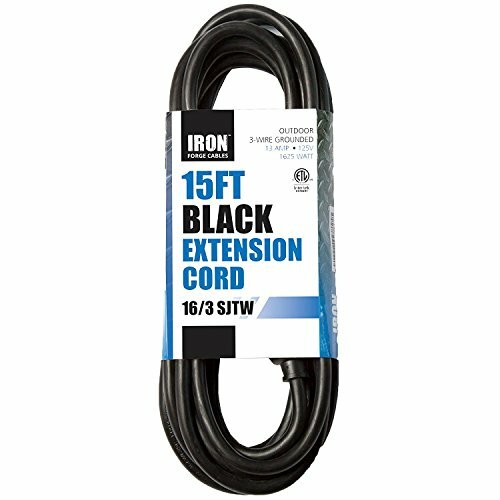 When all you need is to extend the range of your heavy duty power tool by a few feet or so, this 10-foot long cable from Iron Forge is a good choice. With such a short length and a 16 gauge wire, this cord is rated as heavy-duty. The power figures are at 13 amps, and 1625 watt, thanks to that short length. For landscape decorations and lighting, you need a cord that blends into the greenery. This Woods cord maybe the perfect choice with its dark green hue. The three outlets provide power to charge multiple devices/light systems. Woods is a trademark brand of the popular Coleman Cable Inc. It comes in the most popular 16 gauge and has a 13 amp rating. This is a dual purpose extension cord from Iron Forge. It can be used both at home and in office, indoors as well as outdoors. The 15-foot long cable provides excellent reach and comes in a discreet black color. It can be used to power a single device rated at 13 amps, and 1625 watts. This is another great option if you want to bring power to your outdoor lighting without messing up the landscaping in your front yard. Green color ensures that it blends into the background. 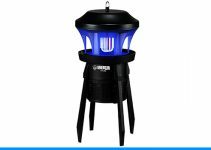 It is rated for outdoor use and has a 16 gauge, three conductor wire inside. You may use this cord for any system or device rated at 13 amps. Green color makes it perfect for landscaped spaces. 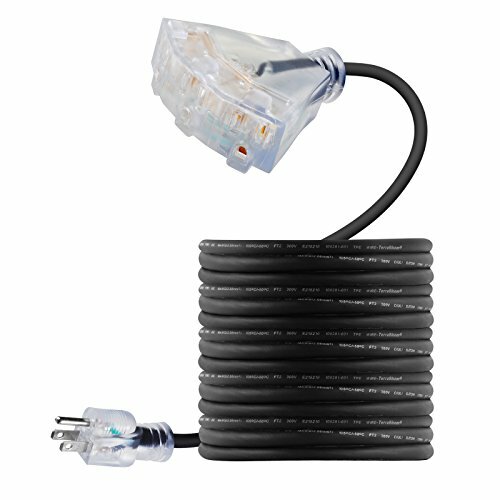 If you want to balance length, gauge and amp rating of the extension cord based on your requirements, TerraBloom may be an excellent choice. They have cords in multiple lengths and gauge combinations, from two feet to 100 feet in length, and in 12 and 14 gauge wire configurations. 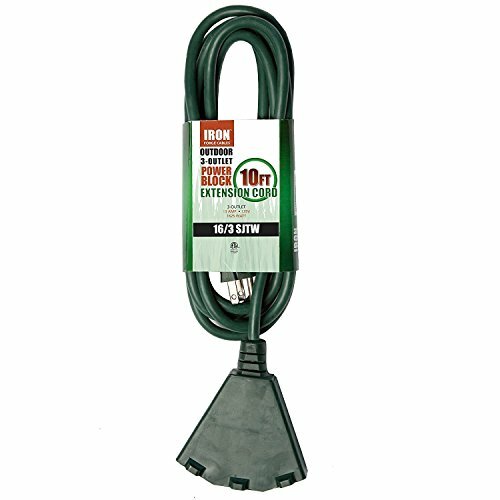 The heavy duty cables are ideal for outdoor use with garden power tools and other appliances. At 25 feet, the 14 gauge has a 15 amp rating. 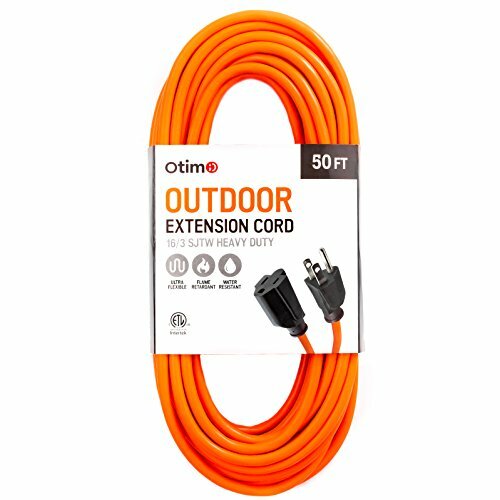 Otimo has several options among their outdoor extension cords in the 16 gauge category. You can choose from three different lengths, 25, 50 and 100 feet, as well as four different color options depending on your preferences/requirements. The yellow, orange and red offer good visibility, while green is ideal for landscaping. 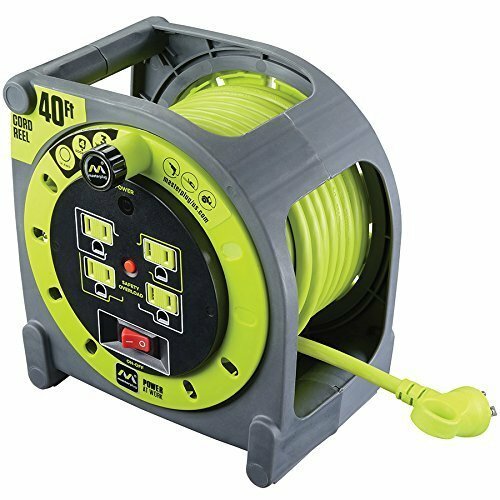 The 50 foot cord is rated at 13 amps, and 1625 watts. A reel system is a great choice, if the cord has to be moved around the yard. This Masterplug cord is an ideal companion for power tools like chainsaws and leaf blowers. The reel system keeps the cord tangle free. The 14 gauge wire is rated at 10 amps across 40 feet. 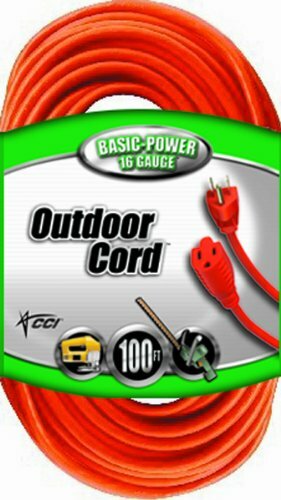 When you need a discreet looking cord to blend into your patio or deck, this cord from Prime Wire and Cable may be a good choice. It comes in a beige/tan coating and is quite long at 35 ft. The product is available in packs of 1 and two cords. The wire is 16 gauge and rated at around 13 amps at 35 feet.